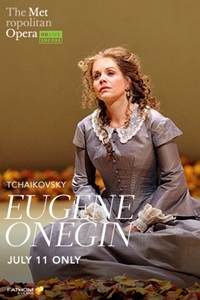 The Met: Live in HD Summer Encore series presents a re-broadcast of Tchaikovsky's Eugene Onegin, in select cinemas nationwide on Wednesday, July 11. Beloved American soprano Renée Fleming joins Russian baritone Dmitri Hvorostovsky for a performance of Tchaikovsky's masterpiece of unrequited young love. The opera's sweeping dramatic arc of this opera-youthful longing, rejection, regret, a desperate plea that comes too late-is perfectly mirrored in Tchaikovsky's achingly beautiful music and in the gorgeous lighting of this strikingly minimal production.